A delicious dessert for festive occasions, this custard apple pudding is easy to make and colourful. 1. De-seed the custard apple and retain the pulp. 2. Boil the milk, stirring continuously, till it is reduced by half. 3. Add sugar and mix until dissolved fully. 4. Remove and cool to room temperature. You can also keep it in the fridge. 5. Add the custard apple pulp and mix well. 6. Garnish with dry fruits before serving. 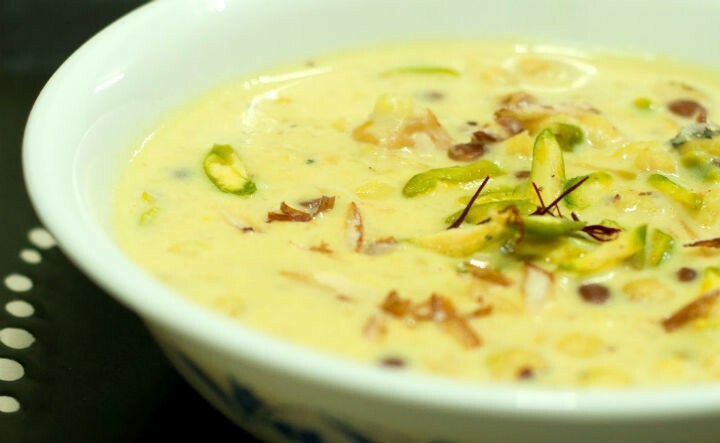 Feel free to comment or share your thoughts on this Sitaphal Ki Kheer Recipe from Awesome Cuisine.